Kanagawa Prefecture states that it “is working toward individualized, patient-centered health care that fosters a society of health, security, and happiness.” The prefecture believes that system administration is critical to achieving this goal. Therefore, they aim to establish a health care ICT system that allows citizens, medical institutions, and essential organizations to efficiently utilize health and medical care information through the use of electronic medical records, clinical trial data, pharmaceutical data, and other health data. Another application of the health care ICT infrastructure will be at the individual level. The “My ME-BYO Record Project” will support people in managing their health by giving them access to a type of personal health record. In Kanagawa Prefecture, there are on-going efforts to collaborate with academia and research institutions to develop effective human resources who can contribute to the efforts of Healthcare New Frontier. The prefecture does not limit human resources in this field to those with a medical background, but instead it prioritizes those with a global perspective and those with a wide variety of knowledge and experiences. By opening up the scope of expertise to include, for example, engineering and economics, the prefecture is aiming to gather a group of people capable in contributing to advances in medicine and ME-BYO industries. As an example of their efforts, the prefecture collaborates with academia and the general public to hold regular public lectures on a wide variety of topics. In addition, Kanagawa Prefecture contributes to international human resource building through various activities including, co-hosting translational research and human resource development symposiums with the US NIH/NCATS and supporting Kanagawa-based universities in co-hosting medical seminars with the National University of Singapore. Kanagawa Prefecture plans to open a facility called the Medical Innovation School to support the development of human resources in this area and preparations are currently underway. Kanagawa Prefecture is also working in collaboration with domestic universities to host public lectures on a variety of topics for students and the general public. 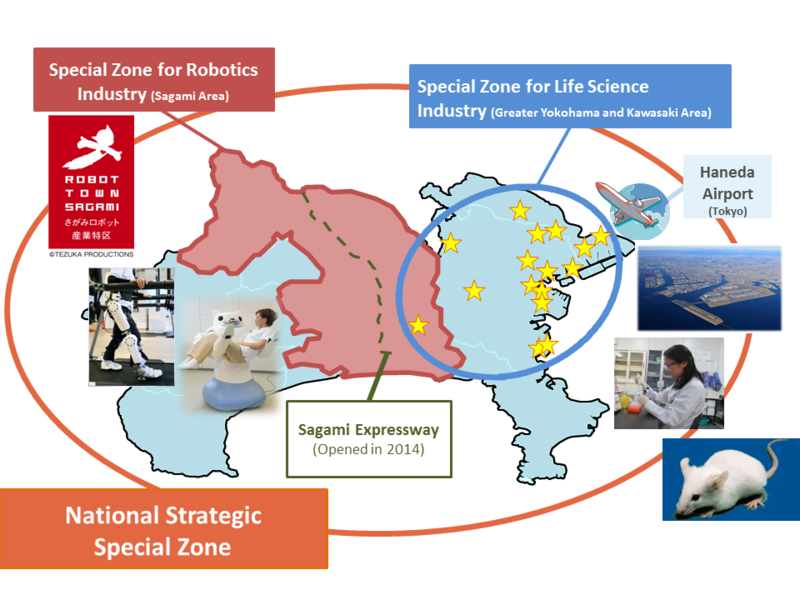 Kanagawa Prefecture carries out the initiatives of Healthcare New Frontier through three special zones: Comprehensive Special Zones for International Competitiveness Development, the Sagami Robotics Industry Zone, and the National Strategic Zone. Kanagawa Prefecture uses these zones to further efforts in regulatory reform, industry related to advanced medicine, health care industry, and robotic technology. Currently various industry and research institutions, including the Central Institute for Experimental Animals and the Johnson and Johnson Tokyo Science Center, are focusing on these areas. In the future, Kanagawa Prefecture expects that industry will be spurred by this focus. In addition, industry growth will also be seen in the ME-BYO industry as well. The concept of ME-BYO is also said to be successful at attracting business leaders as well. For example, Fuji Film Co., Ltd. and Ajinomoto Co., which previously were not active in healthcare market, have increased their healthcare portfolio alongside growth of the ME-BYO industry. The Sagami Robotics Industry Zone, in the center of Kanagawa Prefecture, supports the development of robotic technology in areas such as health and long-term care to both provide a sense of well-being to people as well as contribute to economic growth. To achieve this, there are ongoing efforts to develop this technology and gain more public understanding of the benefits of such technology. Three specific ways that Kanagawa is working toward these efforts include the “Juten Project,” which is said to have a large impact on lifestyles of people in the prefecture; the robot competition that is open to applications from around the country; and Kanagawa’s Open Innovation platform that supports development of small to mid-sized industry. The Comprehensive Special Zones for International Competitiveness, designated by the national government in December 2011, provide a place for global companies to develop pharmaceuticals and medical devices while utilizing area resources and the industrial base in the Keihin area. Both Kawasaki City and Yokohama City promote this area as a place where associated industry or medium and small-sized business can implement strategies that spark economic growth and become more internationally competitive. Kanagawa Prefecture’s Keihin Coastal areas cover space within Kawasaki City and Yokohama City. The special zones as well fit into these areas and include Tonomachi in Kawasaki and Suehiro District in Yokohama. In total, there are 17 zones that center efforts on life science innovation. The goal of these zones is to grow industry and to support global companies to develop and manufacture pharmaceuticals and medical devices that will be able to provide personalized and preventive care. In addition to advocating for special regulations, tax adjustments, and financial incentives, the zones are contributing in the following three areas: establishment of a medical examination database and information sharing system; creation of new ways to address issues and the acceleration of global clinical trials related to advanced medical technologies; and creation of ventures and other entrepreneurial companies through guided networking and matching. The Prefectural government strives to collaborate with governments, companies, organizations and academic institutions in Japan and around the world. 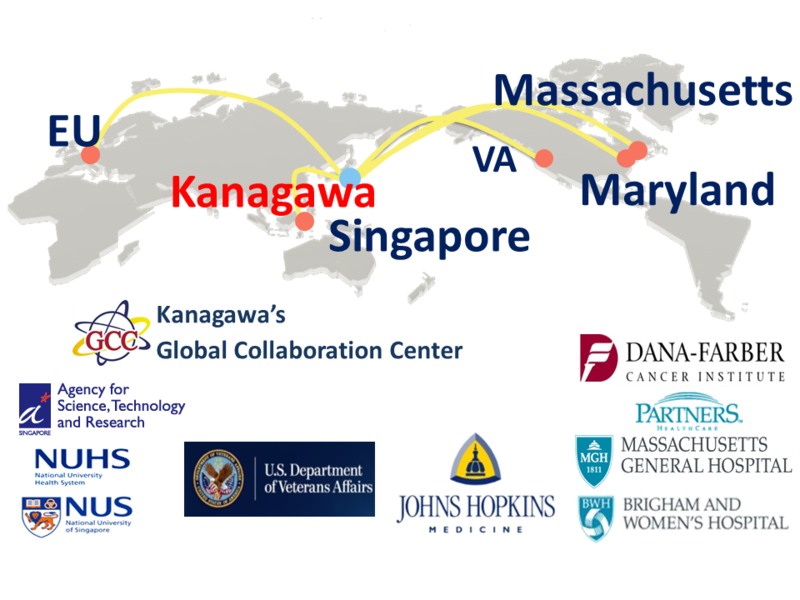 Kanagawa Prefecture established the Global Collaboration Center (GCC) in April 2013 and has succeeded in building partnerships in the US, Europe, and Asia. Several of these partnerships include MOUs related to biotechnology, life science, and human resource development that further efforts within Healthcare New Frontier. Partnerships that have been established include Singapore Government, the US State of Maryland, the US State of Massachusetts, Oulu in Finland, and Baden-Württemberg in Germany. As Kanagawa Prefecture is the fastest ageing area in Japan, it strives to become Japan’s leader in healthy longevity through the growth of industry and markets, technology, global networks, and collaborations with local and global industry. Through these efforts it hopes to share Healthcare New Frontier within Japan and around the world.